The joint CEO's of Germany's largest bank, Deutsche Bank, the twelfth largest bank globally in terms of assets, unexpectedly announced their resignation over the weekend. Anshu Jain will resign at the end of this month, almost two years ahead of schedule while Juergan Fitschen will stay on until May of next year. The announcement followed what Deutsche Bank described as "an extraordinary meeting" over the weekend. It is particularly surprising given that Jain had been granted extra powers at the bank only two weeks ago to reorganise the scandal plagued lender. In the past year Deutsche, like many international banks, have been found to have been engaged in a slew of corrupt practices from manipulation of interest rates, for which the firm was fined $2.5 billion in April, to tax evasion and money laundering to "mis-selling" of derivatives. Deutsche Bank’s derivatives position is truly enormous. It was recently estimated to be around $54 trillion. Germany's GDP, the fourth largest in the world, was a mere $3.64 trillion in 2015. 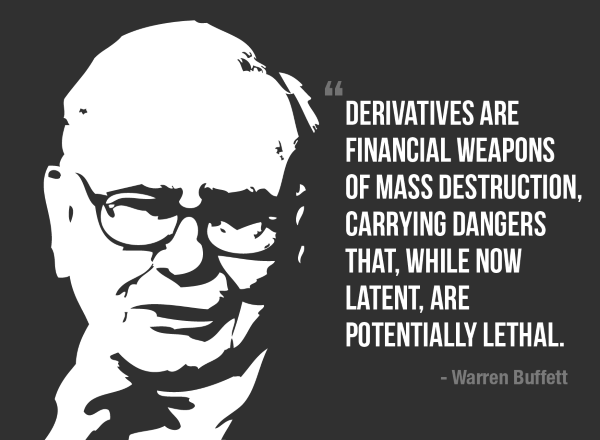 Were Deutsche Bank caught off-side in its derivatives positions there is not a government or institution on earth that could bail it out and it could lead to contagion in the German financial system and indeed in the global financial system. The contagion from such an event would be devastating. 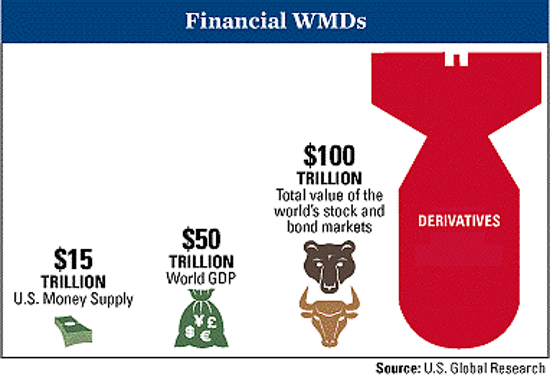 It is for this reason that Warren Buffet described derivatives as FWMD or "financial weapons of mass destruction." It is unnerving that the shock resignation should follow an "extraordinary meeting" over the weekend following the failure of Greece to meet its scheduled payment to the IMF on Friday. The debris caused by the massive volatility in the Swiss franc following its being unpegged from the euro - where it spiked 30% in minutes in January - seems to have been swept under the carpet. Austria's bad bank Heta failed in late February with apparently no casualties. A quadrillion is an incomprehensibly massive figure: it is 1,000 times a trillion (1 with 12 zeroes). A trillion is 1,000,000,000,000 and a quadrillion has 15 zeroes - 1,000,000,000,000,000. The annual gross domestic product of the entire planet is between $50 trillion and $60 trillion. Thus, the derivatives market's notional value is more than 23 times the size of the value of all of the goods and services traded in global economy in one full year. The crisis in Greece, the rumblings in the global bond market and indeed in Europe's fourth largest bank and the threat posed by financial weapons of mass destruction should give cause for concern. It is another reason to reduce allocations to stock and bond markets and increase allocations to gold. Today’s AM LBMA Gold Price was USD 1,173.40, EUR 1,053.32 and GBP 769.85 per ounce. Friday's AM LBMA Gold Price was USD 1,175.90, EUR 1,044.25 and GBP 767.82 per ounce. Gold and silver were both down last week - down 1.58 percent and 3.77 percent respectively. Gold fell $6.10 or 0.52 percent Friday to $1,170.90 an ounce. Silver slipped $0.08 or 0.49 percent to $16.10 an ounce. Gold in Singapore for immediate delivery ticked lower and then higher and was up 0.1 percent to $1,172.86 an ounce an ounce near the end of the day, while gold in Switzerland was again flat. A stronger dollar, near a 13 year high verses the yen, may have contributed to gold’s recent weakness. After Friday's U.S. nonfarm payrolls report showed its largest growth since December, up 280,000 from last month, gold sunk to an eleven week low at $1,162.35 an ounce. The payrolls figure was significantly higher than the 225,000 that analysts were expecting. Although some question the veracity of the Bureau of Labor Statistics jobs numbers. The jobs number led to renewed idle speculation that the U.S. Fed may start to raise interest rates in September. A senior U.S. official today denied a news wire report that President Barack Obama had told a Group of Seven industrial nations' summit that the strong dollar was a problem. Bloomberg News earlier quoted a French official as saying Obama had made the comment. "The President did not state that the strong dollar was a problem," the U.S. official said. He made a point that he has made previously, a number of times: that global demand is too weak and that G7 countries need to use all policy instruments, including fiscal policy as well as structural reforms and monetary policy, to promote growth." Sentiment in the euro zone weakened further in June as the Greek debt crisis and a slightly firmer single currency prompted investors to pare back their expectations for the economy. Sentix research group's index tracking morale among investors and analysts in the euro area slipped to 17.1 in June from 19.6 in May. That was below the Reuters consensus forecast for a reading of 18.7. The world's largest gold back ETF, the SPDR Gold Trust, saw holdings drop 0.17 percent to 708.70 tonnes on Friday, its lowest since mid January. This shows poor sentiment in the gold market. In late European trading gold is up 0.31 percent at $1,174.81 an ounce. Silver is up 0.08 percent at $16.11 an ounce and platinum is up 0.41 percent at $16.11 an ounce.